Just like real life, social media is all about status, and on Twitter, status was traditionally measured by a user’s Followers total. However, it’s become increasingly well recognised that the Twitter Followers total is close to meaningless as a yardstick of status or influence. Using follow-management apps, it’s easy to churn up a Followers total of 100,000 or more, virtually none of whom will ever pay the remotest bit of attention. So the preferred indicator of influence is now engagement. How many Likes, Retweets and Replies each tweet gets. If you have 200K Twitter Followers, but your tweets get just one or two Likes each, you ain’t no influencer. Retweets are a particularly important element of Twitter engagement, since not only are they an engagement measure in themselves – they’re also a means to attract a lot more engagement. Retweets can get you more Retweets, more Likes, more Replies, and if they get you new Followers, those Followers are likely to be highly engaged, long-term readers of your tweets. Most unlike the type of follower you get from playing the follow-for-follow game on churn apps. 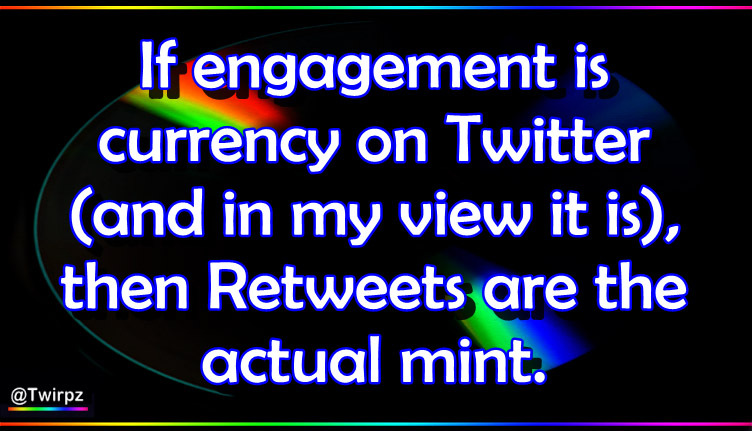 If engagement is currency on Twitter (and in my view it is), then Retweets are the actual mint. Retweet-begging does, at cursory glance, appear effective. 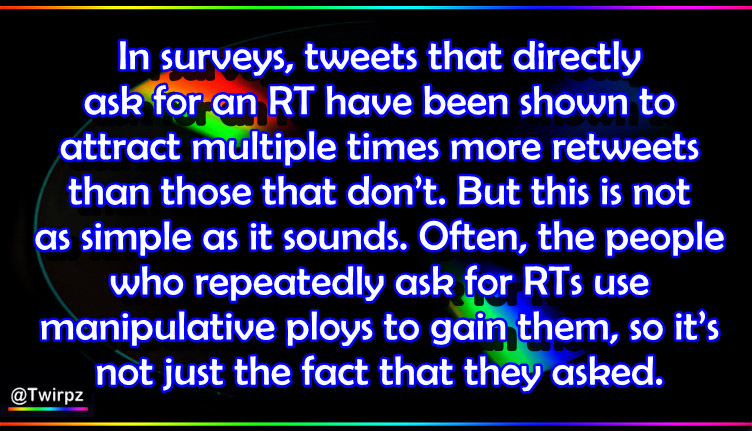 In surveys, tweets that directly ask for an RT have been shown to attract multiple times more retweets than those that don’t. But this is not as simple as it sounds. Often, the people who repeatedly ask for RTs use manipulative ploys to gain them, so it’s not just the fact that they asked. But just as there will always be those who think: if I don’t RT that I won’t look cool, caring or knowledgeable, there will also be those who are put off by retweet-begging. If you perceive your audience to be considerably intelligent, blunt retweet-begging is probably a bad move. As soon as someone spots that you’re trying to use them to further your Interests, they’re not going to be at all impressed. Additionally, the practice of retweet-begging can quickly become a crutch, and thus get more and more repetitive – becoming easily identifiable as a form of spam. 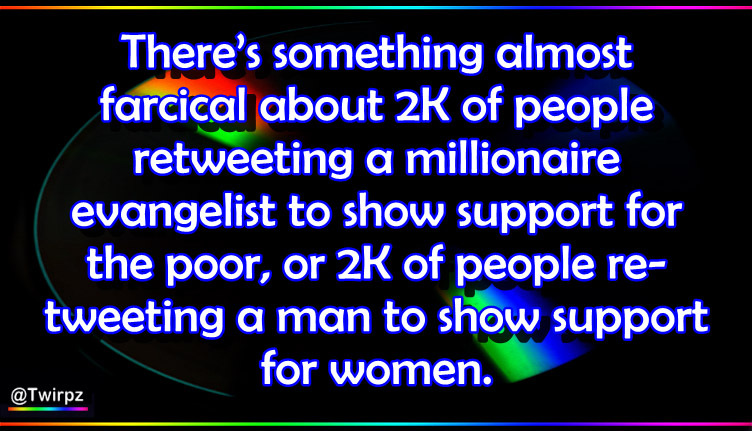 Perhaps the worst element of all is that retweet-beggars don’t get to see who, or how many people, they’re alienating. It’s a false economy for a business to be attracting people who won’t spend, if it’s alienating those who will. There’s definitely a link between retweet-begging and low-integrity businesses or traders. Certainly so-called ‘e-marketers’ or ‘digital marketers’. And a lot of scammers use retweet-begging strategies too. It’s not what one would call a reputable area. This attempts to secure the vital celeb-retweet through ego-baiting and commercial enticement, but if the celeb does retweet, the fanbase will be very heavily motivated to retweet too. The fans want to be seen by the celeb as supportive and helpful, and some are absolutely desperate for the celeb’s approval. Some will feel they have no choice but to retweet. No dude. That’s getting YOU retweets. If you wanna get her retweets, retweet her, or post a link to her actual poetry page. Some RT-beggars using this ploy will even lever in links to their own web pages. Some minor celebs will still retweet them. But the RT-beggar also runs a high risk of being publicly challenged by someone with a lot more social clout, reach, support and virality than themselves. Minor celebs and influencers can sometimes become livid if they think someone is trying to leech off their hard-earned profile. That could prove a PR disaster for the RT-beggar, although retweet-beggars are normally spectacularly thick-skinned. This is the most difficult area of retweet-begging to criticise. An e-marketer or self-styled ‘influencer’ finds noble causes, and then asks for retweets on the pretext of ‘raising awareness’. It’s all very transient. This week it might be depression, then next week it’s under-nourished hedgehogs, and the week after that it’s their own book on renovating a villa. Whilst people obviously won’t say most of those words in practice, we do tend to see a passive-aggressive manifestation of the above. It’s common behaviour on Twitter. There are many, many genuine cause-campaigners on the platform, and I want to draw a very clear distinction between their laudable, well-researched and often tireless efforts to help people and animals; and the crass, transient, cursory, DGAF cause-hijacking we see from certain e-marketers and self-styled ‘influencers’. The cause-hijacking mentality can get particularly ugly after a major disaster, with marketers even hijacking important disaster hashtags to promote their own, unrelated crap. You can say that the greed of the general public is to blame, but the prolifery of Twitter profiles which bait retweets with promises of money or goods has continued to boom. The most commonly recognised incarnation is probably “RT to win an iPhone!”, but trends have evolved, and direct offers of cash payments have now become very common. A lot of the men offering “free cash” for retweets specifically target women. People have made businesses out of these ruses, and their accounts can attract hundreds of thousands of followers. Retweet-begging is not necessarily an indication of ulterior motive, but it usually is. Retweets are currency, and that means when you retweet a Twitter user, you’re increasing their status. If the user is asking for retweets on behalf of another Twitter user, and you feel THAT person, charity or group deserves an accolade or more reach, retweet THEM. There’s something almost farcical about 2K of people retweeting a millionaire evangelist to show support for the poor, or 2K of people retweeting a man to show support for women, or even 2K of people retweeting a nostalgia bot to validate the fact that their memory still works. Find the people who deserve retweets, and retweet them on merit. Not because people tell you to. Previous PostHow To Avoid Losing Arguments on Twitter: 12 Modern StrategiesNext PostIs Flickr Guilty of ‘Freemium Extortion’?